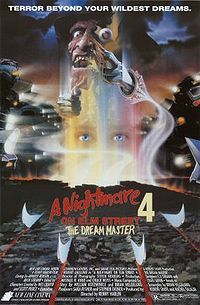 Nightmare on Elm St Part 4 : The Dream Master is the second part of the Dream trilogy. Kristen, Joey and Kincaid the survivors of the last film are once again having bad dreams. Because of this Freddy finds the strength to return. He stabs Kincaid in the chest, and drowns Joey. Kristen reveals the truth to her other classmates. Kristen’s mom betrays her and forces her to fall asleep allowing Freddy to kill her. Before she dies she passes her ability to enter other people’s dreams to her new friend Alice, ( the new hero of the series). After her boy friend Dan is almost killed by Freddy, Alice takes the fight to Freddy’s world. She is able to defeat him using a spell that can stop bad dreams. Part 4 cont Kristen’s story from the previous film. In this film she is now played by Pop star Tuesday Night. Patricia Arquette at this point had become too popular of a film star to return to the Nightmare franchise, like Johnny Depp before her. This film was the highest grossing Nightmare film at this point (years later Freddy vs Jason would top it ) Friday the 13th Part 7 The New Blood also came out this summer and this was the real Freddy vs Jason as Freddy beat Jason to the tune of $49 mil to $19 mil. This was the first Nightmare movie I had ever seen and it still holds the test of time, as with part 3 Freddy was very silly but still scary. The special effects are fantastic and, some of the characters carry over to Part 5. This was also the first time Robert Englund was on Good Morning America to promote the film series.